Scientists at the U.S. Department of Energy's (DOE) Argonne National Laboratory, in collaboration with DOE's Ames Laboratory, have reported an important and unexpected reaction mechanism—called "redox behavior"—on the surface of catalyst support materials that have application in the chemical industry. Most industrial catalysts are anchored to metal oxide supports such as silica, alumina or zirconia. Recently, sulfated metal oxides have emerged as a promising support material for carbon-containing metallic ("organometallic") catalytic complexes. They are also promising catalytic materials in their own right, with application to chemical processes in the petrochemical industry. Using a combination of theoretical calculations and measurements with advanced analytical techniques, the research team investigated the interactions between an organometallic iridium catalyst and support materials composed of sulfated alumina and sulfated zirconia. These interactions took place during a catalytic reaction promoted by the organo-iridium species with the support materials. Thanks to previous research, scientists had been aware of a catalysis pathway that involves the donation of protons from the sulfated metal oxides. The research team discovered a second pathway, a redox reaction involving the acceptance of electrons from the organometallic complex on the sulfated metal oxide surface. 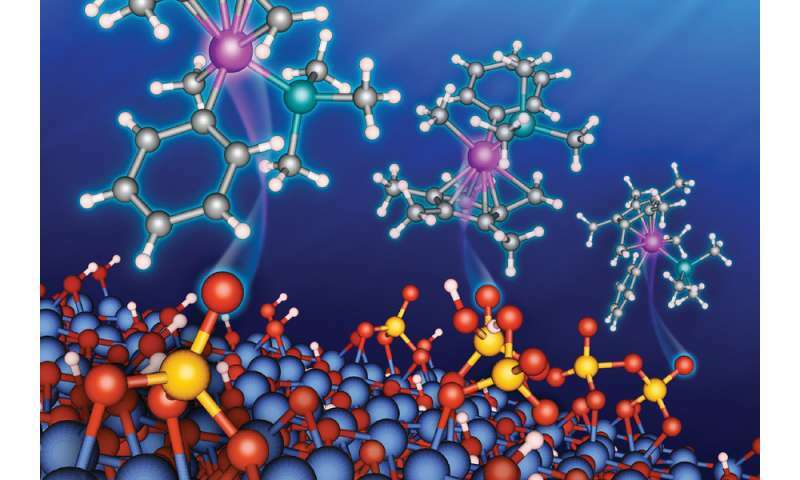 They also discovered that some sites on the sulfated metal oxide surface that had been proton-donating could be transformed into electron-accepting sites, thereby changing the organometallic catalyst's chemical behavior. Argonne chemist Max Delferro, an author of the study, commented that "in this redox mechanism, our material takes its usual chemical routine and turns it on its head—instead of giving up a proton, it gains an electron." The appearance of the hydrogen isotope deuterium in the organometallic complex signaled the occurrence of a redox reaction that had not previously been reported. In addition, the researchers found that both surface hydration and sulfate loading in the support material play a key role in the redox process. According to Delferro, the research provides insights to the catalysis community concerning the potential for similar mechanisms to form an important part of catalytic relationships, including those in which supporting surfaces act as their own catalyst. "This observation provides a proof of principle that an important set of reactions is happening and should not be ignored," said Argonne postdoctoral researcher David Kaphan, another author of the study. The study, titled "Evidence for redox mechanisms in organometallic chemisorption and reactivity on sulfated metal oxides," appeared in the April 9 online issue of the Journal of the American Chemical Society.